“Last Crusade” begins with a surprise. The fedora-wearing adventurer we see ends up being some random bad guy. Instead we hear Indy’s name called from one of his fellow Boy Scouts. 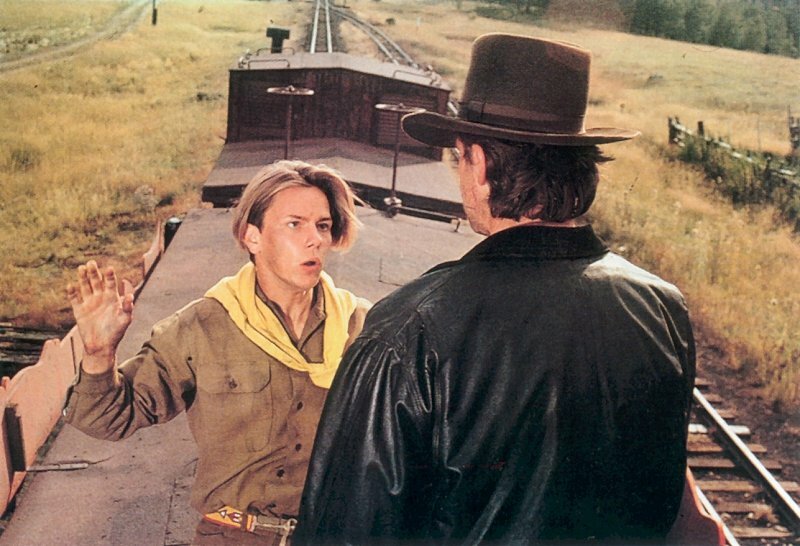 Young Indiana Jones (River Phoenix) is in pursuit of the Cross of Coronado and is incensed when the bad guys want the artifact for their own gain rather than putting it in a museum. The train pursuit sequence gives the audience a lot of hints about Indy’s character and traits we already know to be true, but where not aware of their origins. We get to see why he is afraid of snakes, his amateur use of a whip and his ability to swashbuckle and escape the most impossible of situations. The opening photography and landscapes as well as the wide shots of the train chase were incredible, memorable and product of veteran cinematographer Douglas Slocombe, who just recently passed away on February 22, 2016 at the age of 103. Indy and Shorty are trapped after Shorty accidentally tripped a booby trap closing them in and sending the spiked ceiling of the room barreling downward toward them. Indy screams for Willie to come and help them before it is too late. Reluctantly, Willie enters the passageway. She discovers the ground is moving beneath her and is actually covered in creepy, crawling bugs of all shapes and sizes. She is pounding to get in and they are intent to get out. She has to reach in a big filled grimy hole and pull the release lever in order to save the two men. She doesn’t want to, but does it anyway. Indy, Willie, Shorty and Indy’s hat narrowly escape and move forward. The sequence is chilling, repulsive and makes you cringe when you see the bug swarm. Most people do not like bugs, especially thousands of them, and the idea of this chamber filled with bugs would be enough to drive most of us insane. We empathize with Willie and what she must do as her solution. Indy and Sallah discover the underground cavern containing the Ark. They open the stone tablet covering the opening only to reveal a large, menacing stone statue. Indy is not happy when he sees the piles of slithery reptiles below. They make their way down into the chamber. They remove the Ark from its tomb. Unfortunately, their triumph is short-lived as they are discovered by the Nazis. The Ark is taken from them and Marion is dumped down into the cavern to be entombed with Indy forever. Only through cunning, brute strength and avoidance of myriads of snakes do they make it to the adjacent room of the cavern and make their escape. For those who are claustrophobic or others who just hate snakes, the scene is revolting and miserable for the heroes. The quick loss of torch light and ability to use fire against the reptiles adds to the intensity of the scene. The solution must be presented quickly before they are left alone in the dark to their doom. After squashing a large guard using a rock crusher and surviving attacks on his voodoo doll, Willie and Shorty discover and board a mine cart to plan their escape. Indy whips his way down to join them. The Maharajah tells Shorty to take the left tunnel to find the way out. Indy switches the track the wrong way and group heads off to the right. Mola Ram quickly dispatches his random guard hoard to follow our heroes and try and stop them. The twists and turns, the intense heat, the fast pace and the nasty pursuers make for an unforgettable, thrill ride sequence which you will never forget. The back and forth, tunnel jump and use of the cart brake to slow their speed and keep them on the track all provide important elements which add to the fun. The sequence is also a testament to stop-motion animation which was used immensely during this scene intercut with the actors to make the action even more over the top. The “Anything Goes” opening to “Temple of Doom” is buttoned up with a mad scramble on a Shanghai nightclub floor. Indy has unsuspectingly drank deadly poison in his beverage which will soon take effect. Willie eyes a large diamond which she is very interested in procuring for herself. Unfortunately, a melee ensues within the nightclub which send patrons retreating everywhere. An ice bucket is knocked over adding to the misery in both Indy trying to find the vial of antidote while Willie looks for the diamond. Willie finally locates the vial which she stuffs down her shirt. Indy and Willie narrowly escape out a window behind a rolling gong only to discover they have fallen into Short Round’s taxicab. The indoor scrum sequence along with the melee for the antidote/diamond provide an appropriately engaging first act to the film and introduce us to the new and old players well. Indy and Marion are bound together in back of a large congregation of Nazi soldiers all gathered together to watch evil French guy, Rene Belloq (Paul Freeman), and his companions unearth the secrets of the Ark. Indy warns Marion to close her eyes and not to gaze upon the contents no matter what happens. Initially, all seems well as smoke pours from the opened artifact. Ghostly spirits wisp through the soldier’s ranks until the main spirit turns from beautiful to deadly. Belloq is enveloped in flame. He blasts beams from his eyes penetrating some of the watching soldiers. His two cohorts become overwhelmed with heat and their faces melt from their bodies. Belloq explodes succumbing to the frenzy. All the deceased, broken bodies are swept up in a final flourish into the sky and replaced within the confines of the Ark as the cover is replaced. Indy is grateful he and Marion are spared. Ford and Allen are great in the scene as they try extremely hard to look away and not become another victim. Suffice to say, audiences in 1981 had never seen a sequence like this before. It is truly a one-of-a-kind in many ways. The entire film builds to the scene as we all want to know what lies within the Ark, but we are still surprised when it actually happens. The wax work with the faces is still impressive this many years later and the visuals still stay with you even to this day. Another mention of the John Williams soundtrack underscores the entire sequence impressively and make it even more unique and unforgettable. Indy stares at his initial prize down a long, cave passage. As much as he wants to rush toward it and claim victory, he knows it can’t be that simple. There must be traps that await him. He manages to get himself to the altar where the idol rests. He takes out a bag of sand, estimates its weight, and gingerly exchanges the idol with the sand hoping he has done it correctly. After a split second of peace, he quickly discovers his efforts were not quite good enough and the cave begins to crumble around him. He runs past the flying darts, a dropping wall and over a chasm before being faced with his first real challenge, a giant boulder. The look on Ford’s face says it all and you really believe he is scared out of his mind as he races toward the exit. He outruns the 22’ rolling menace only stumbling slightly. He crashes out of the cave and tumbles down the rock face covered in spider webs only to end up at the bottom surrounded by enemies and his nemesis, Belloq. Belloq makes Indy forfeit his prize. According to IMDb, the sound of the rolling rock was made by sound designers recording a Honda Civic in neutral. Spielberg loved the finished rock so much, he extended the scene in the film to show off its marvel. If you were to show someone who had never seen an “Indiana Jones” film before one scene, it would be this one. It is the most iconic, maybe the best opening action sequence in a film of all time. It has everything: thrills, spills and introduces us to the stylized world of our favorite screen archaeologist all at the same time. Before we know anything about the man himself, the persona is showcased perfectly in the scene and the world he inhabits comes to life. Here’s hoping his eventual 5th adventure is as memorable as his 1st.